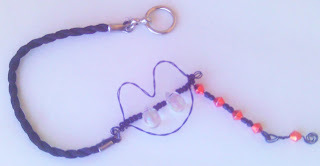 For the Vampire Blog hop, I made 3 things. 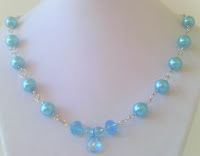 The first is a necklace with dyed turquoise. One of them actually looks like a real heart, lol. It has Tibetian Silver spacer beads and black glass beads. 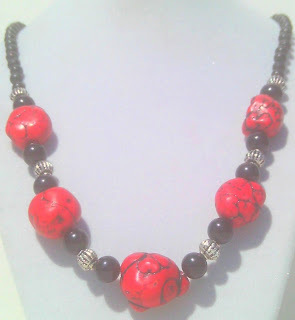 This next necklace is red and black, of course, lol. 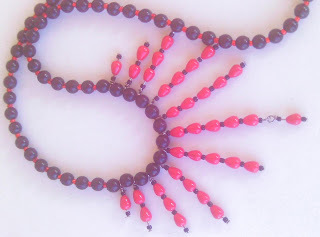 made with black glass beads, red seed beads and small red drop beads. This next item didn't turn out anything like I wanted it too. 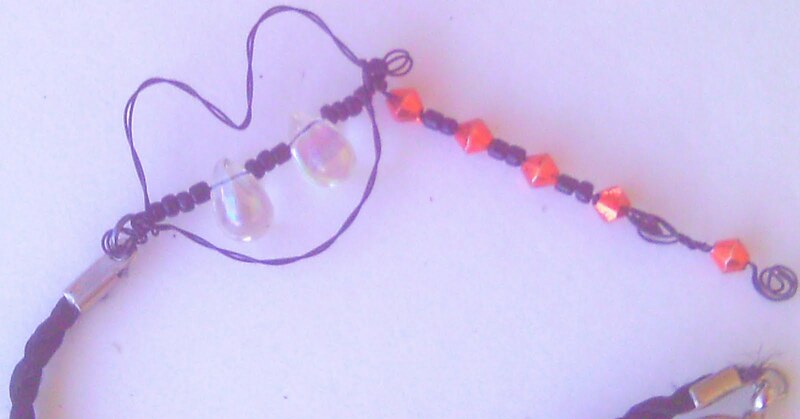 At first it was going to be a pair of earrings but, I gave up so, it is a cell phone dangle or to hand on teens binder or whatever. The wire is actually black. Why it looks blue in the pic, I have no idea! Usually with dream catchers, I have to do one of them over at least three or four times before I get two that match close enough to be considered a pair. This time, I did it on the first try. Talk about a relief, lol. 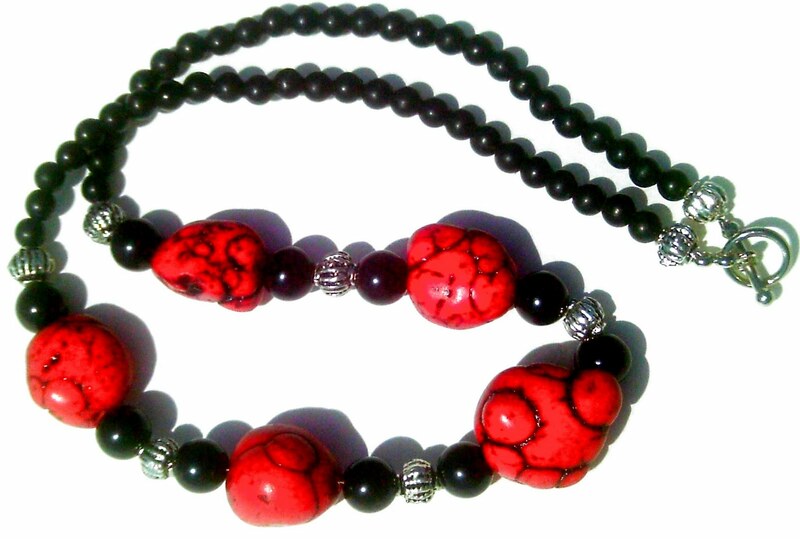 These will be available on my site later this evening. (Have a ton of errands to run. Tax return came in today, lol). 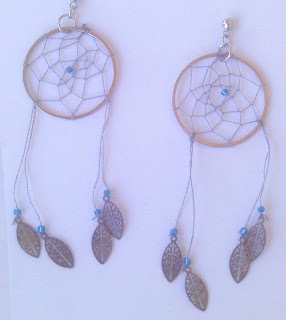 The "Feathers" are silver filigree. Lemon Drop - Last of the accidental citrus theme! 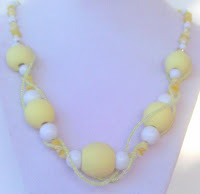 Here's the lemon drop necklace. I have had the yellow and white nugget beads for quite sometime but could never seem to find anything to go with them. So.......I decided to try painting some wood beads since I have tons of them! I think they turned out pretty good and match perfectly. 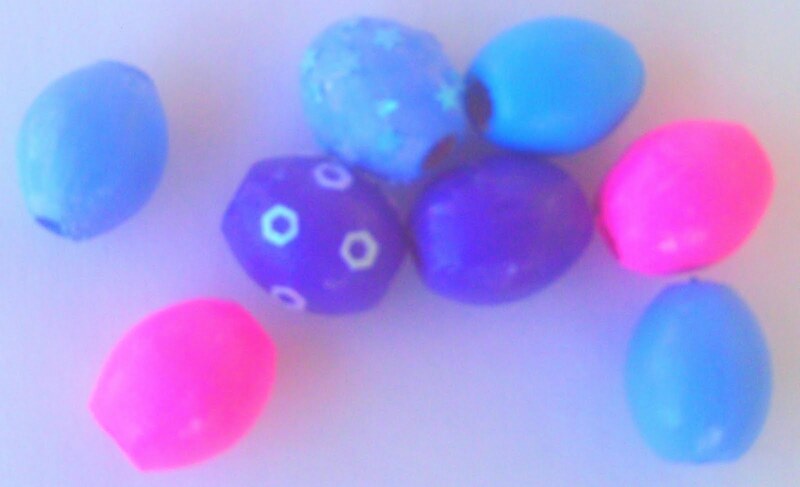 I tried painting some other wood beads different colors to see how they would turn out. 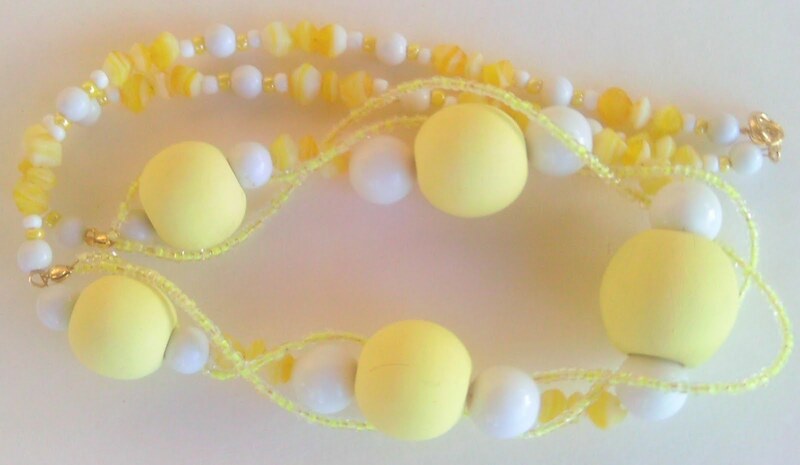 The yellow ones used for the Lemon Drop Necklace, I used a non glossy finish so they would have a matte appearance. These other beads, I gave a glossy finish. A couple of them, I even added some fingernail decals, lol. 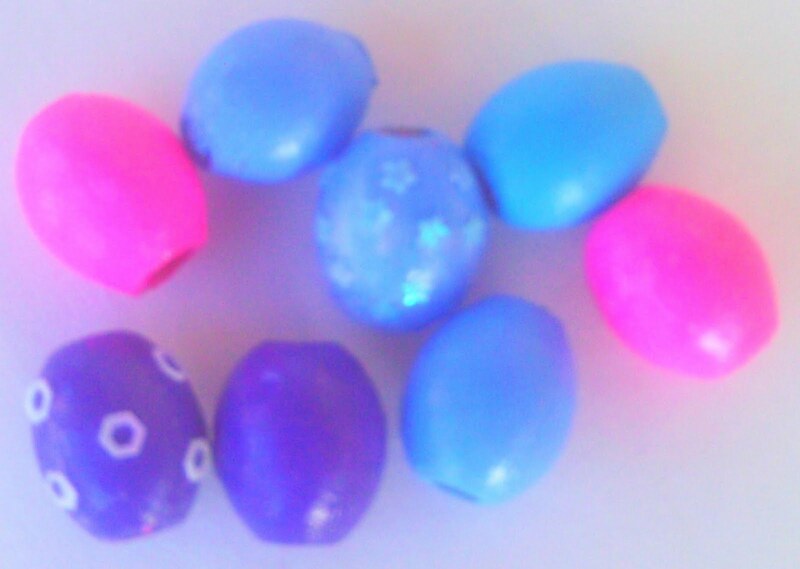 Actually, they look kind of like easter eggs!!!!! 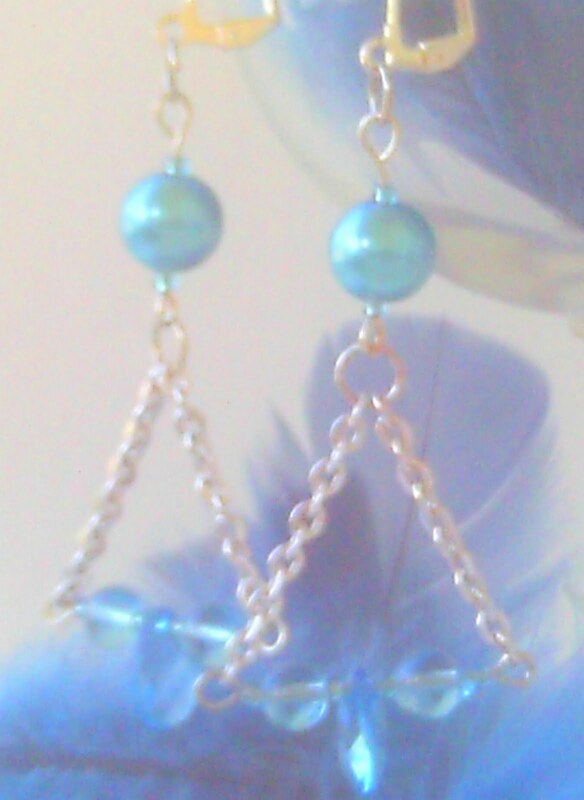 I think I need to try some less flashy colors. 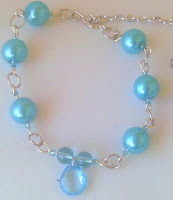 Have a new necklace and bracelet. By accident, they both are on a citrus theme. 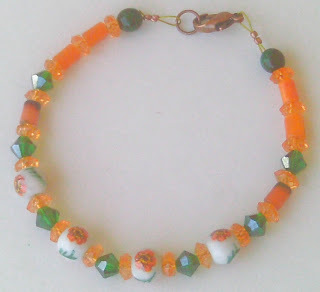 The Twist of Lime necklace and the Orange Grove bracelet. 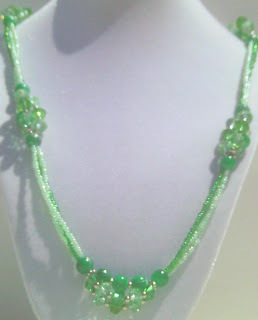 I also completed a necklace this morning called the Lemon Drop necklace, lol. I don't have pics of that one yet, so that will have to wait. The Twist of Lime necklace consists of three strands, twisted of course, in shades of green. 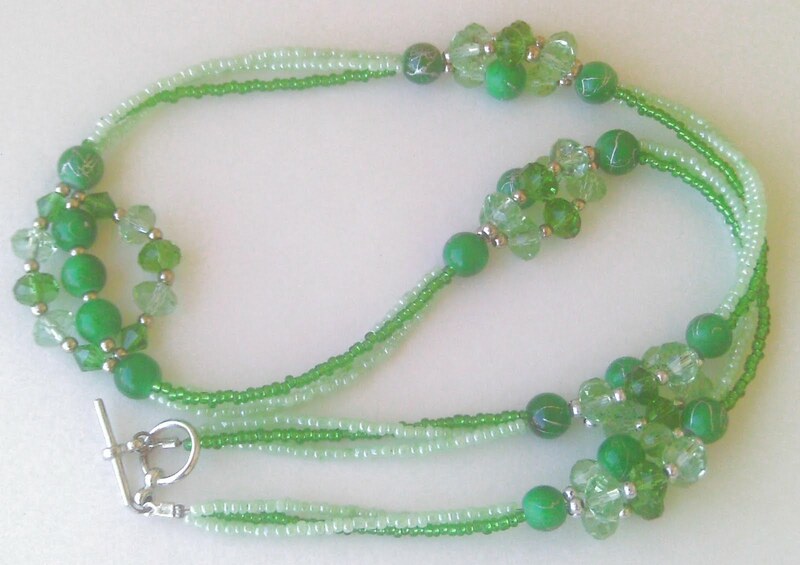 It has green, silver streaked, glass beads, round and rondelle crystals and seed beads, all in shades of green. The Orange Grove bracelet has some glass beads with hand painted orange flowers, orange rondelle spacer beads, orange barrel beads and green bi-cone crystals with a copper lobster claw clasp. 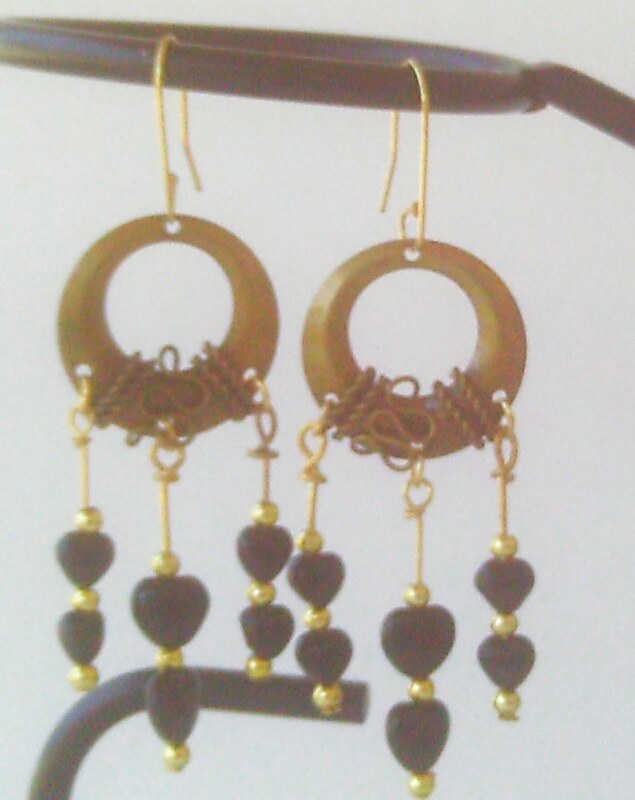 First of all, I added a couple pair of Egyptian style earrings. 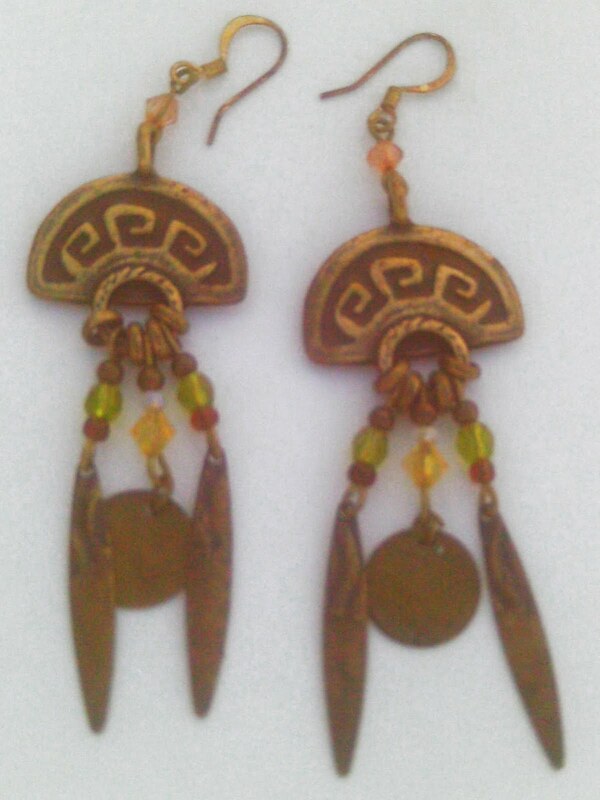 These were made mostly with copper elements. 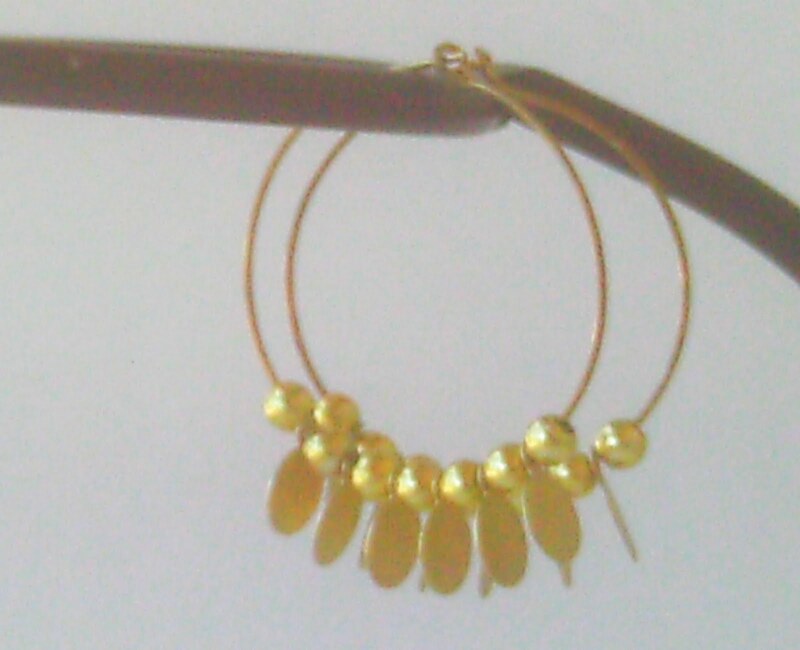 The next 5 pair of earrings are all hoop style earrings. 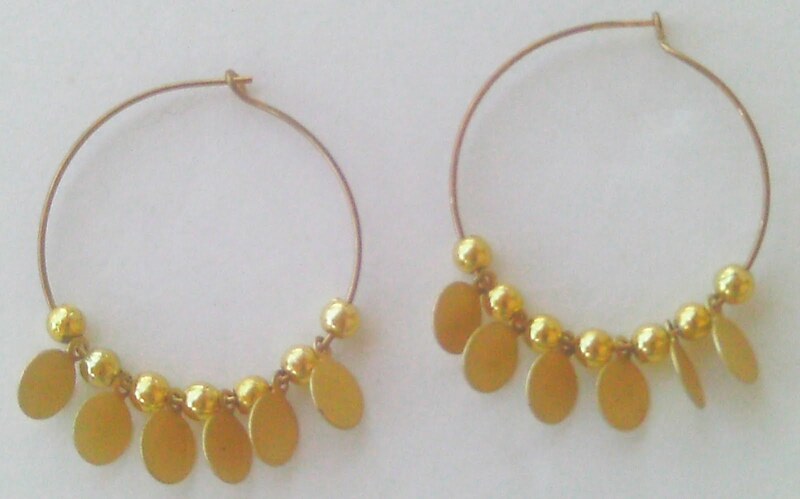 The first one being a dangle hoop and the rest being single hoop earrings. 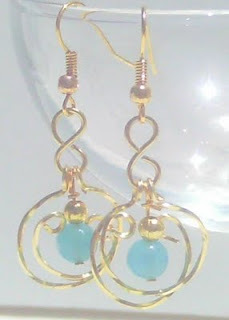 This first pair were made with square gold plated wire and some blue Jade gemstone beads. 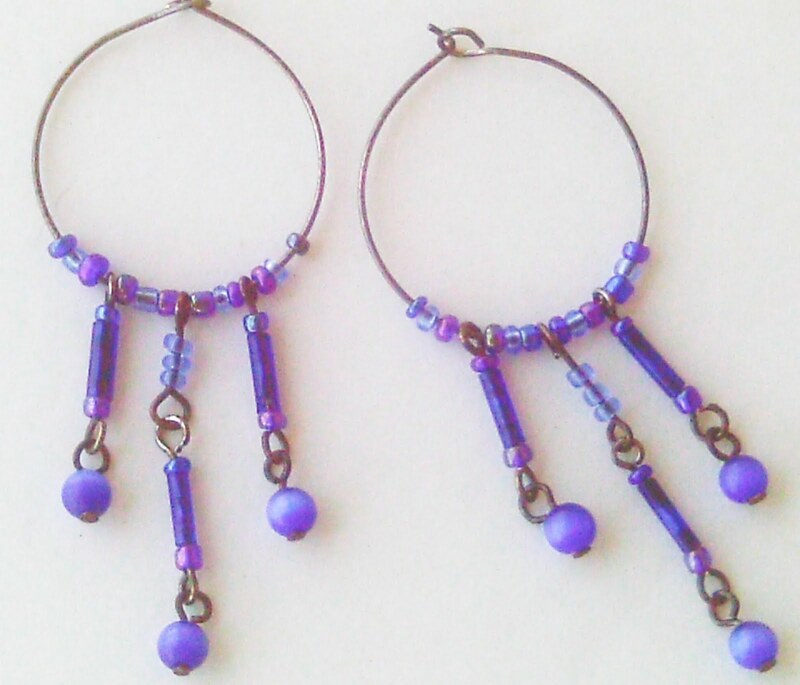 These next 3 pairs of hoops are 1 1/2 inch in diameter. This pair were made with metal beads and metal discs. 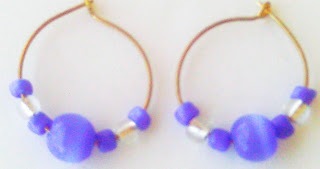 The Raindrop hoops were made with blue drop beads and blue bi-cone crystals. 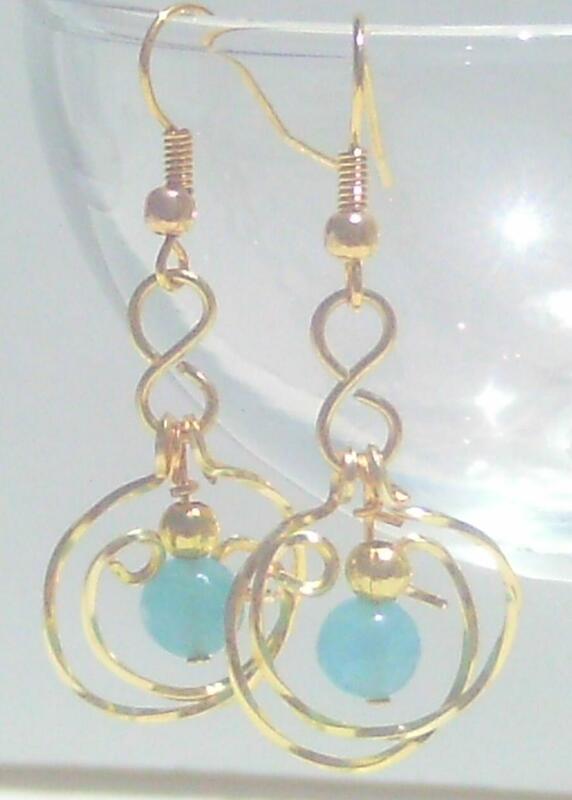 These next two pair of earrings are Cat's Eye Hoops. 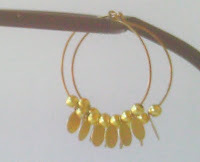 One small hoop at 1 inch in diameter and 1 medium hoop at 1 1/4 inch in diameter. The small hoops use blue cat's eye beads, blue (AB) bugle beads and blue seed beads. The medium hoops were made with blue cat's eye beads and blue and clear seed beads. I will be adding more earrings, a necklace and a bracelet later this evening. My son is going to Disney Land with his Chorus class and will be leaving at 3:00 am. 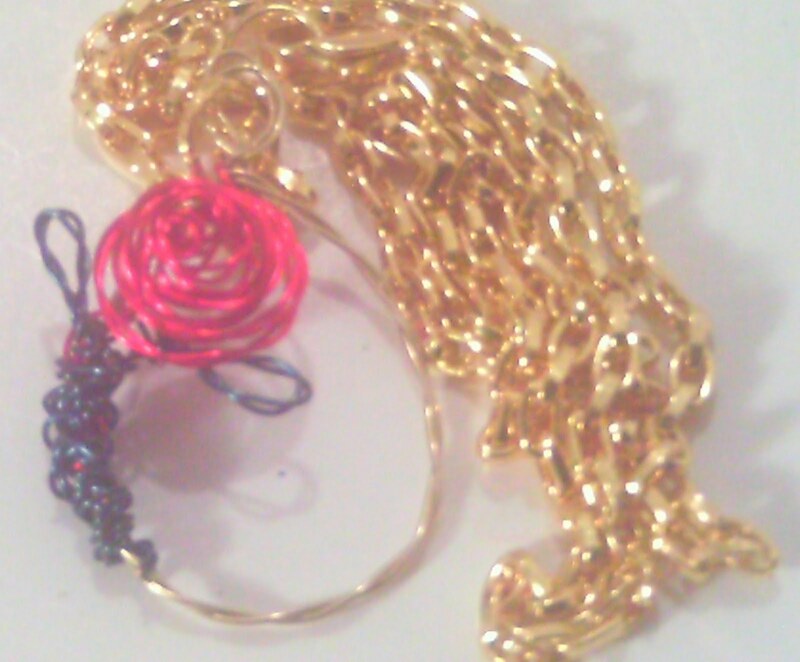 So I will be up, creating, lol. 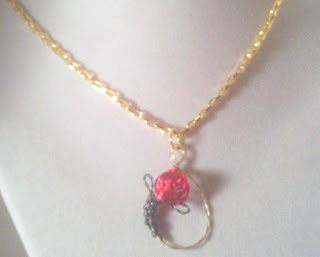 I am also working on my Vampire jewelry blog hop piece(s). This bracelet is one of my favorites so far. It's a bit heavy but not TOO heavy. 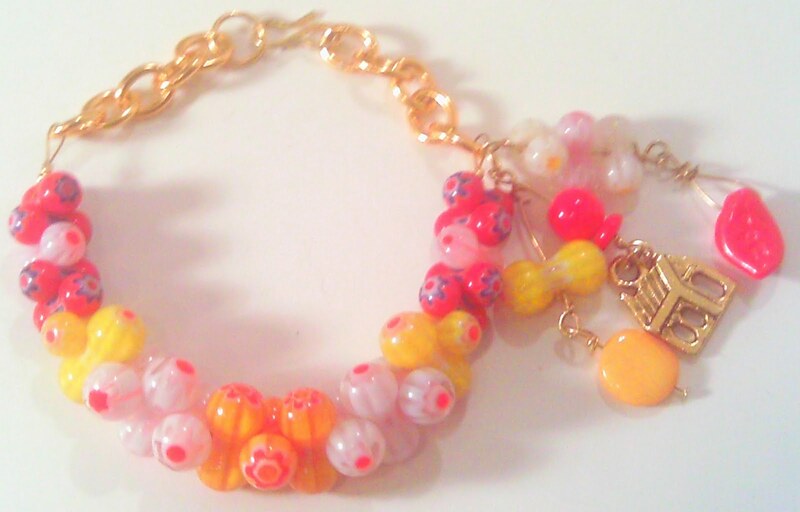 It is made with Millefiori barbell beads. chain and some charms, a red glass bead leaf, a Mother of Pearl disk bead and a house charm. 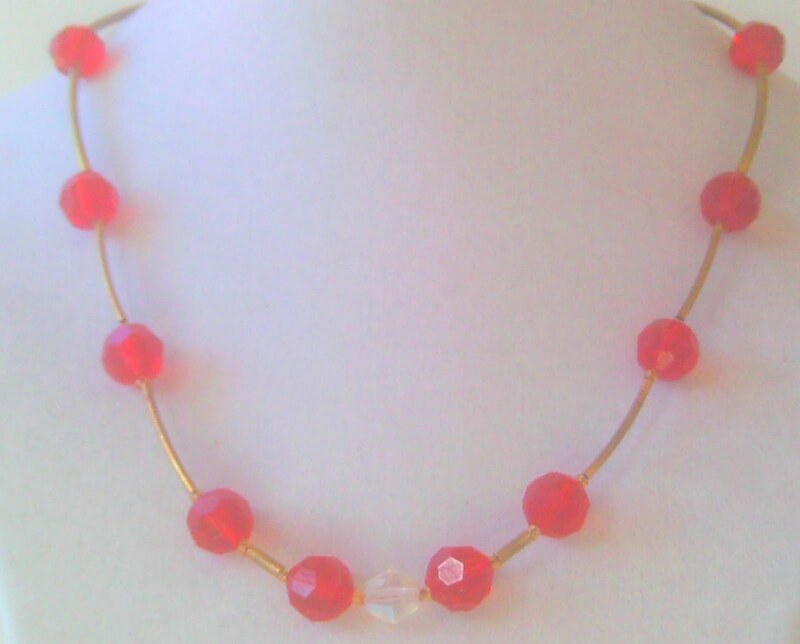 Next is the Red Noodle Jewelry set which is a necklace and earrings. 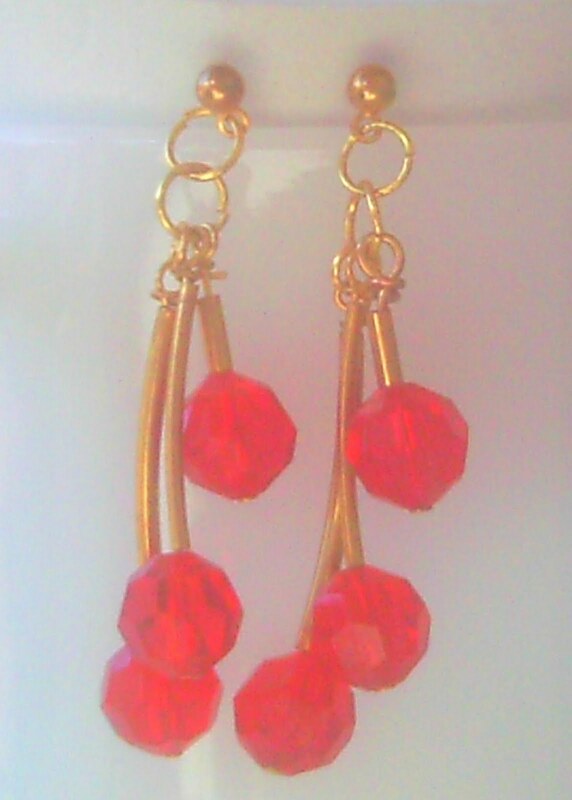 This set is made with red beads and gold noodle beads. Ok...So, I finally ordered some square wire. For my very first time working with square wire I chose this decorative cross. 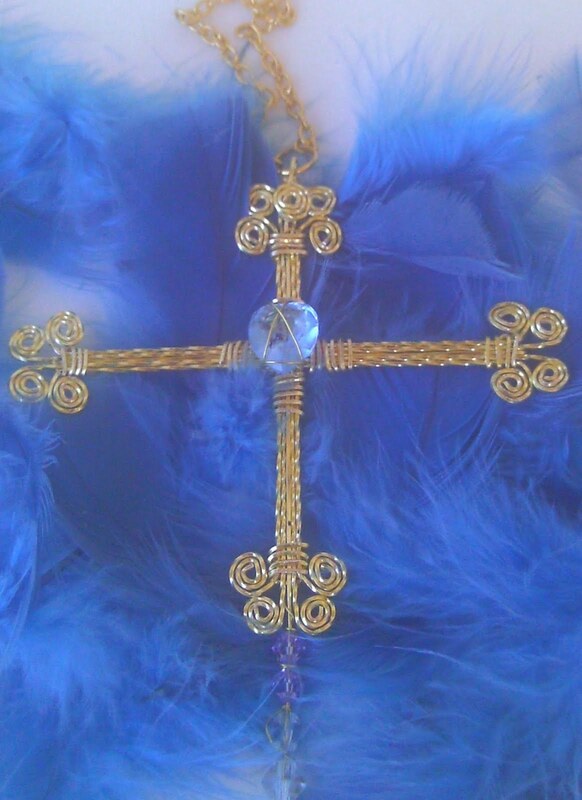 It's way to big for a pendant, but would go great hung on your mirror or over your bed. 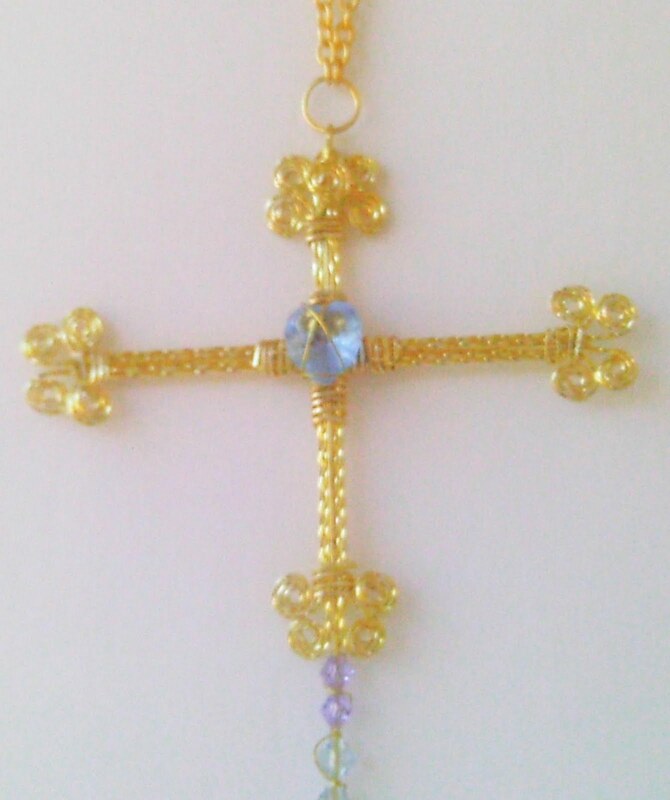 I realize that it's FAR from perfect but, I think it could have been a lot worse. And hindsight being what it is, I probably should have picked a first project that didn't utilize a ton of wire. But I am blonde, so...go figure. Also added to my site this evening is a 3pc. 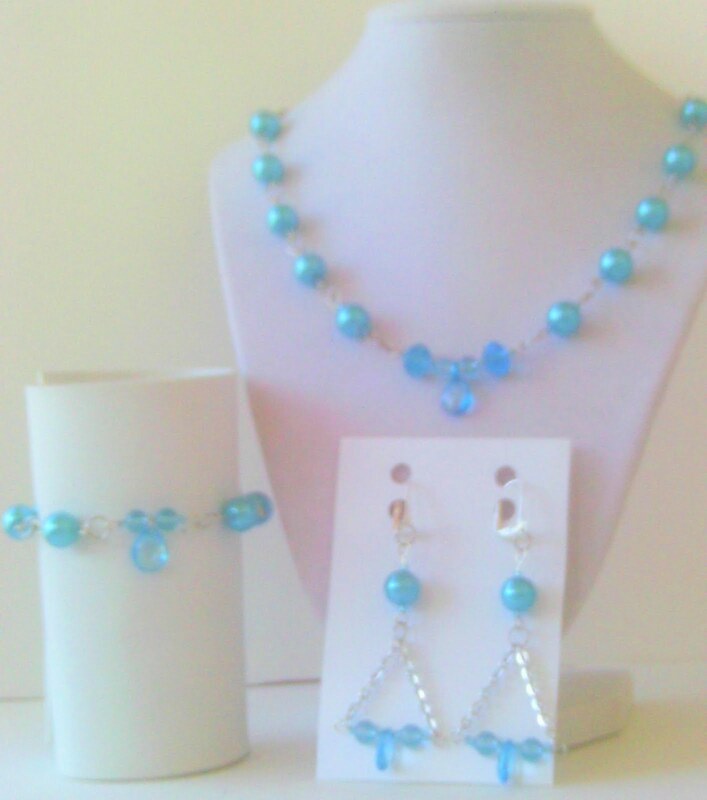 Jewelry set. Tear Drops. 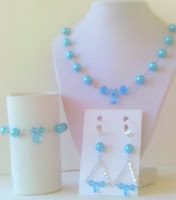 The set includes: Necklace, Bracelet, and Earrings. .I seem to have a heck of a problem with my pics. They just go wherever they want all over this blog, lol. Sorry about that! This pendant was inspired from a design by Zyta Rogowska. 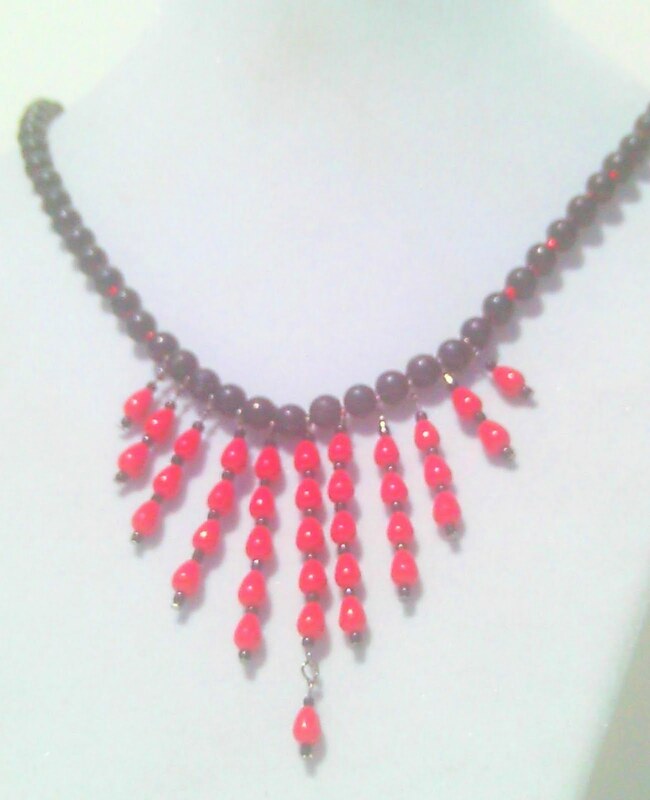 I Think this is my first design that does not use at least ONE bead or stone. Hope you like it. 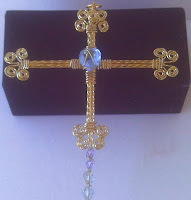 I have a ways to go with wire working......but practice, practice, practice! !